Islamic state extremists have ‘bulldozed’ the ancient Assyrian city of Nimrud in northern Iraq near Mosul with heavy military vehicles, the country’s authorities said. This is the latest in a series of ISIS attacks against Iraqi heritage. "They [Islamic State (IS, formerly ISIS)] assaulted … Nimrud and bulldozed it with heavy machinery, appropriating the archaeological attractions dating back 13 centuries BC," says a statement from Iraq's Ministry of Tourism and Antiquities on its official Facebook page. The ministry added that the group continues to "defy the will of the world and the feelings of humanity." However, it didn’t specify the extent of the damage made to one of the pearls of the Assyrian era. The destruction started on Thursday after noon prayers, an Iraqi antiquities official told AFP, adding that the trucks were also seen at the historic site. نمرود اهم مدن العراق الاثرية أسسهاالملك كالح في1300ق.م أصبحت عاصمةالآشوريين في900 ق.م دمرتهااليوم جرافات داعش! pic.twitter.com/Li0dPt3Bpq"
"Islamic State members came to the Nimrud archaeological city and looted the valuables in it and then they proceeded to level the site to the ground," a tribal source told Reuters. "There used to be statues and walls, as well as a castle that Islamic State has destroyed completely." “We cannot remain silent. The deliberate destruction of cultural heritage constitutes a war crime,” said UNESCO Director General Irina Bokova. Some scientists and experts compare the destruction of Nimrud to the demolition of the Bamiyan Buddhas in Afghanistan by the Taliban in 2001. "It's really called the cradle of Western civilization, that's why this particular loss is so devastating," Suzanne Bott, head of heritage conservation for Iraq and Afghanistan at the University of Arizona, who worked at Nimrud, told AP. "What was left on site was stunning in the information it was able to convey about ancient life,” she added, “People have compared it to [ancient Egyptian] King [Tutankhamun’s] tomb," Bott said. The extremists are intentionally destroying the heritage of Iraqi people, believes Jack Green, chief curator of the Oriental Institute Museum at the University of Chicago and an expert on Iraqi art. "It's the deliberate destruction of a heritage and its images, intended to erase history and the identity of the people of Iraq, whether in the past or the present," he said. "And it has a major impact on the heritage of the region." 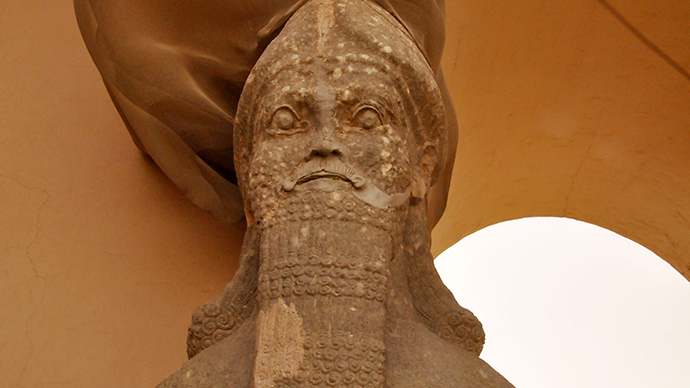 Assyrian city of Nimrud was founded in the 13th century BC, and is located on the Tigris River. The Assyrian Empire was one of the most powerful states of antiquity, rising around 2500 BC and occupying territory from the Mediterranean Sea to the Caspian Sea. In the 1980s, scientists discovered the city’s royal tombs, one of the notable archaeological finds of the 20th century. Most of the priceless artifacts have been moved to museums of Mosul, Baghdad, Paris and London. However, the giant statues of lamassu - an Assyrian deity depicted with a bull or lion's body, eagle's wings and human's head - remained on site. The attack on Nimrud comes a week after Islamic State militants destroyed another historic site - a museum in Iraqi city of Mosul which was captured by them in June. The group posted video online showing militants destroying ancient statues and other artifacts, saying they are symbols of idolatry. Some of the objects date from the seventh century BC.